I'm no scientist, but the basic smoothie formula is a lethal poison. How everyone else is immune, I don't know. And I don't know the specifics about what it is about each of these ingredients: dairy, banana, strawberry, and in what combination they are most lethal because I've tried soy substitutes to no avail. But whenever I 'give it another go' and have a smoothie, one that everyone else can enjoy, I die. I've done myself a great disservice by not doing more work in enjoying the smoothies out there don't include these toxins. 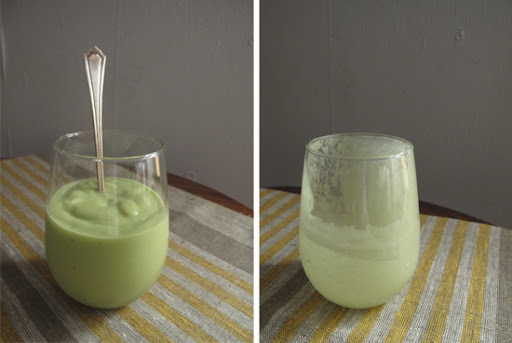 The smoothie in the photo is an Avocado-Pear smoothie. I haven't had avocado really outside of Mexican fare, but I gave it a go, and I may be now obsessed. I forgot to pick up silken tofu - I've also never had it or seen it before. I made it without and thought it was amazing so I probably won't worry about ever adding it unless I'm in need of some protein. The recipe says it is four servings, I halved it and considered it to be one serving, so it's it probably makes more like 2. The rest of the ingredients I just eyeballed, it's a smoothie, after all. Toss them all in the blender and have at it. Seriously, it's amazing. Here's to freedom from stomach aches! Have you tried the orange date shake from the NYT? Yum!